Interestingly, though, Cyborg isn’t totally missing from Titans’ orbit because of the Doom Patrol spin-off series. According to DC, this incarnation of the Doom Patrol—Robotman, Negative Man, Elasti-Woman, Crazy Jane, and Dr. Niles Caulder—will come together after being called upon by Cyborg himself to embark upon an adventure into the weirder, darker corners of this shared universe. 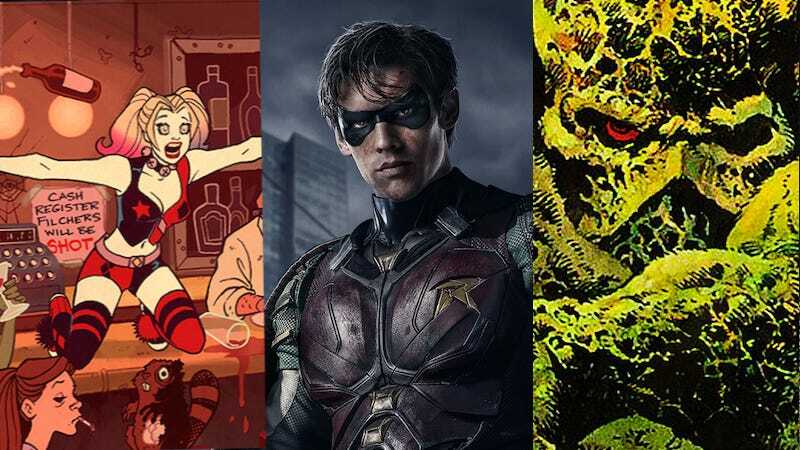 There’s no telling whether the Doom Patrol will ever cross with Abby Arcane, but Swamp Thing is set in one of DC Universe’s dark corners. The show will follow as the heroine travels to Louisiana to investigate a strange swamp-born virus only to discover that there’s more magic and danger in the bayou than she ever could have realized. On the animated side of things, Young Justice: Outsiders revives the beloved series and brings a number of new faces into the fold as the world is plunged into an intergalactic arms race to locate and weaponize the growing population of young metahumans. While most of DC Universe’s programming is aimed at a more general audience, the new Harley Quinn series will be decidedly adult and find a newly single, Joker-free Harley teaming up with Poison Ivy as she schemes her way into the Legion of Doom. Currently, no pricing has been announced for DC Universe, but fans can sign up for access to the upcoming beta today. DC plans on launching the service later this fall.